From southern Scandinavia through Central Europe (here only scattered) to southern Italy and southern Greece, from northern Spain to the Carpathians. Mountains up to 1500 m.
Back poor in contrast, buff, olive to brown, uniform or weakly spotted. The belly is all or nearly unspotted, as often happens in Moor frog and less in Common frog. The long hind limbs are very distinctive, allowing of 2 m great leaps. Heel extends beyond the snout tip (picture). Nuptial pads on the thumbs of the are grey. 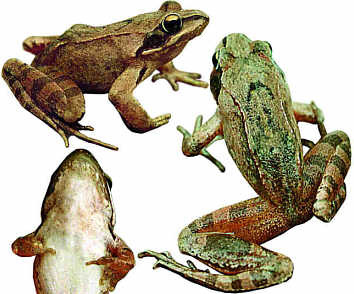 Both ear drum and metatarsal tubercles are generally larger than in Common frog. Often already in early March, usually before Common frog. The submerged call is a soft fast "waug….waug….waug….waug". On bright warm days several males may be calling in chorus also at the water surface. Often inhabiting waters in woods.